Presumptive Democratic presidential nominee Hillary Clinton said she is "heartbroken" by the U.S. Supreme Court decision not to allow relief for up to five million undocumented immigrants facing deportation. "This decision leaves these families with that fear. It’s devastating," she told Univision's Senior National Correspondent Lourdes Melluza in an exclusive interview. On Thursday, the court deadlocked in a 4-4 tie in the case of U.S. vs Texas, which would have allowed Obama's two deportation relief programs, DAPA and DACA, to finally go into effect. The programs would benefit some five million people, including undocumented parents of U.S. citizens and legal permanent residents and undocumented immigrants brought to the U.S. as children. But the programs were blocked in late 2014 by an injunction resulting from a 26-state lawsuit in 2014. Now, the case returns to the Fifth Circuit with an uncertain fate. "I’m going to look for every possible way to remove the fear of deportation from families and I’m going to fight for comprehensive immigration reform so that they can be on the path to citizenship in our country," said Clinton. The Supreme Court decision meant that the two programs DAPA and an expansion of DACA remain on an indefinite hold until either a new Supreme Court justice is added to the bench or Congress passes new legislation. "This makes the stakes in this election even higher and what anyone who cares about immigration should be doing is organizing to elect Democrats, elect me to be president so we can work together to get comprehensive immigration reform," said Clinton, noting that Trump has promised to deport all 11 million undocumented immigrants. "We cannot let that happen. So I need the support of everyone," she said. "I need everybody eligible to register to vote, to get out and vote. I need everybody eligible to become a citizen to try to move quickly to do that. We’ve got to stop this." The Republican-controlled Senate has said it will not hold hearings to replace the seat left vacant by the death of Justice Antonin Scalia in February until a new president is in the White House. 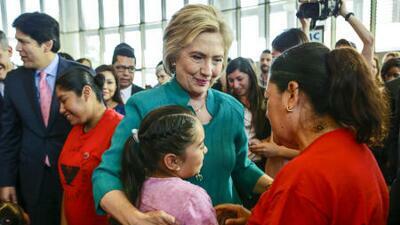 Clinton said that the Supreme Court ruling only applied to an expansion of the Deferred Action for Childhood Arrivals (DACA) program to include undocumented children who entered the U.S. before the age of 16 prior to Jan. 1, 2010. The original program, limited to those under the age of 31 who entered the U.S. before June 15, 2007 and were under 16 years old when they entered, is still in effect. "People should apply for deferred action under it, and that’s what I’m going to be doing. I’m going to be fighting with every tool I can for these families, for these young people," Clinton said, adding that she wants every case to be judged on its individual merit. "I want every person with a sympathetic case to apply for release from deportation. I’m going to fight to put that in place and of course I’m going to introduce comprehensive immigration reform in the first 100 days that I’m president," she said.